After our 4x4 "luxury" tour of Tibet, Nepal was going to be something different. It started when we were dumped off at the border and we had to hike, hitch and bargain our way to Kathmandu. This 12 hour travel day even with the blocked road and flat tire wouldn't have been so bad if it were for Steve's turn to be sick. We took a few days in Kathmandu for recuperation and planning and then it was off to the airport. The scary, scary airport. The trip started with a flight from Kathmandu to Lukla, which sits at about 9,500 feet at the base of the Himalayas. In the map below, we followed the yellow path up and the red one down. All told, it's more than 70 miles of hiking and over 3 miles of vertical climbing. At the start in Lukla, each breath carried about 70% of the oxygen that we get at sea level. At the top, Kala Pattar, we got less than 50% in a gulp. From the start in Lukla, we hiked up through Namche Bazaar to Gokyo and the first Everest viewpoint at Gokyo Ri. 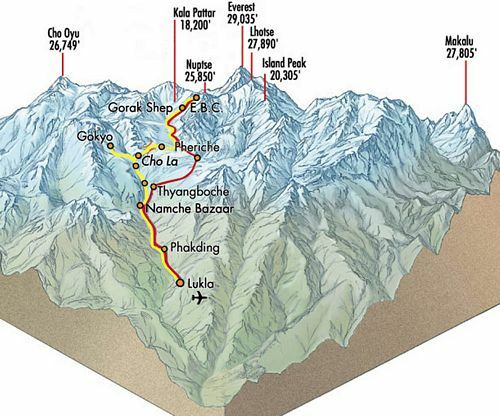 The next challenge was the pass of Cho La. I'd say that was the most amazing part of the hike for me. A little sketchy on the loose rock and then ice going up to the pass, but just an amazing place. From there, we headed all the way to Gorak Shep at 17,500ft the next day. I raced our guide to Everest Base camp the following day and then we did the our 18,500ft+ summit of Kala Pattar before starting the long trudge downhill. And although downhill is better, it's astounding how much 'uphill' there is in 'downhill'. Crossing into Nepal from Tibet was a bit of culture shock. The Tibetan side IS China, and the Nepal side IS India. Pretty soon that fades, and it's just Nepal: verdant landscape, waterfalls and all. The ride into Kathmandu went quickly from that beautiful scenery to pitch grey soot of the city covering our faces. But once inside the ring of smog that envelops Kathmandu, the city opens up a bit, blue sky reappears and the the culture takes over. OK, it's mostly a culture of tourism, but there's still quite a bit of real Nepal to see if you go for a long enough walk. The Himalayan adventure starts in Kathmandu, where navigating the airport takes all the skills you learned in the circus. We were actually lucky enough the first day to have our ticket get us assigned to a flight. We then spent 8 hours waiting for our flight to be cancelled thanks to clouds over Lukla. Two days later we tried again and caught a flight out by the skin of our teeth. Within minutes of landing, we found a guide and were on the trail. Only two days into the hike, we hit Nahcme Bazar, the chocolate cake center of Nepal. Thoughts of the food here kept us going for the next 10 days. We had a couple nice days in the low country, but soon enough were treated to a snowstorm as we entered Machermo on day 4. From here on up, we had the sun overhead, and snow under foot. Machermo, by the way, is where a yeti (abominable snowman) killed 3 yaks and attacked a local woman in 1974. From the beautiful lakeside hamlet of Gokyo, we headed straight up to the Everest viewpoint of Gokyo Ri. Then back down the valley and across the Gokyo glacier to the base of the Cho La pass. The 17,500ft+ Cho La pass offers a somewhat treacherous shortcut from Gokyo valley to the Khumbu area and Everest. What an amazing scene; Cho La was definitely my favorite part of the hike. Down from Cho La and now in the Khumbu valley, we made straight for the final village of Gorak Shep at 17,000 feet. The next day, I nearly lost my lungs racing our guide out to Everest Base Camp. They'll win, but it is fun to watch them stop to catch their breath, too. Our final ascent was to the 18,600ft hill of Kala Pattar for a close up view of Everest. Here, the effects of 50% oxygen start to become more noticeable. But worse than the dizziness were the biting winds that made the balmy 40F seem much more like 0F. The path back down to Lukla was certainly easier, although there were still some good climbs. But the increasing warmth and extra oxygen in the air as we descended were quite nice.